Kyle has always been my math dude.. He would go through the grocery store and be able to add things up as we went and give me a total at the end. It was kinda weird… But lately we have had a few issues with some math. We were doing review of fractions and it seems like he forgot about a few things. As what usually happens, it worked out that I was asked to review A+ Interactive Math. They came out with Math Mini-Courses and one of the courses was Advanced Fractions. Perfect!! As you first log on to the site, you sign up as the parent and then you make an account for any child that is going to use this program. It helps keep track of them as they move through each section. Along with the fractions mini course, we also chose percentages. I figure that is always a good thing to review and it goes well with fractions in my opinion.. When you click on the manage student section, you can see which students you have in which course. It also lists their username and password, which totally comes in handy because that’s just one more password I don’t have to remember, ha! You can log yourself out and log your child in so they can start on their course. They can then click on the red launch button and a new window opens to their dashboard. What Kyle used was the video lessons so all he had to do was push that button. Kyle is pretty good with computers so this was all pretty easy for him to figure out. The next screen shows you the table of contents. As it mentions, you just need to click the ‘+’ sign under the table of contents tab to bring down the list of sections to study. You can start at the top if you like, but what I like is that you can choose any of the selections at any time. I do wish that you could read the selections a little easier since you have to scroll side to side to read all of the choices fully, but that’s just a small thing. Kyle wanted to start further down the list as he was pretty good with a lot of the earlier selections. 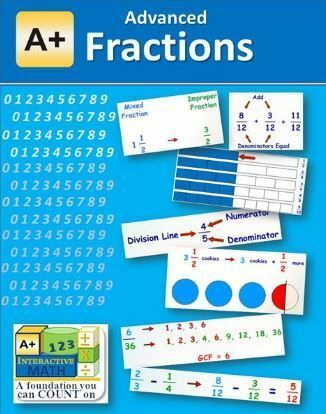 Advanced Fractions has 26 selections to choose from. Kyle started at the 17th one which was converting fractions to percents. When you click on the course you want, there will be a short lesson given. It is short, but it is easy to understand. The woman speaking goes into why you do things not just how to do them. I appreciate that and so does Kyle. There were a few things that Kyle didn’t understand why they were done the way they were, so he commented that he liked that about this program. The woman speaks very slowly…almost too slow for our liking, but I think it helps you keep up and not get bogged down by too much information too fast. After the lesson there are some interactive questions. We came across some that were multiple choice and some that were fill in the blank. For the fill in the blank, you can see that you fill it into the thought bubble of the green frog and then click the frog to continue. If you get it right, it gives you a thumbs up and some encouragement. If you get it wrong, they will go into the correct way to do the problem to make sure you understand. When you are fully done with the lesson, you must mark it complete. You can then print off a certificate for finishing if your child likes that sort of thing. Then, you can move onto the next section that you choose. Even though it seems a little young for my kids, Kyle appreciated how thorough it was in just a short lesson. It really helped the reasoning in his head about certain things and helped him to remember how to do these things again. Most of the courses really are geared to the younger crowd, so it just makes sense that it was a little young. I do like that each course is just long enough. I feel like if it was longer, kids attention spans would kick in and they would be wanting to go off and do something else. And it isn’t too short to where you are questioning what just happened. There are 20 different selections for each math mini-course. Counting and Identifying all the way up to the levels that we did. It is suggested approximately 1st-8th grades for these mini-courses. I wouldn’t say this is a complete curriculum, but it definitely filled in some questions for us that Kyle had, and made him think of things in a way that he understood better than the other things we have tried. You can also print out worksheets and tests, which is what I normally would have done, but the online thing worked out better than I thought it would for us! Since each course is good for a year, I may print off some worksheets a few months from now to make sure he still remembers it all.